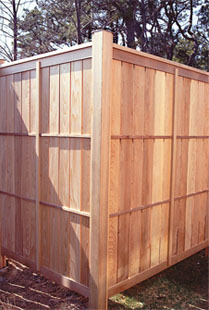 This pergola was designed to provide privacy from a larger adjacent house placed very close to the plot line. 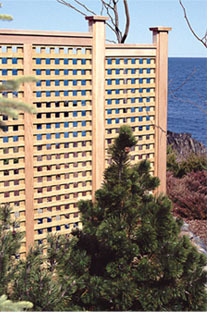 A privacy lattice was built using sub-divided frames and placed between the vertical posts of the structure along one side of the deck pergola. 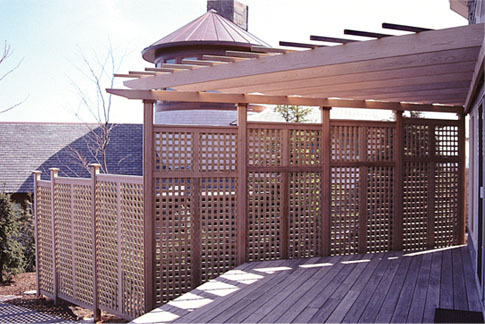 The pergola is set at a 30-degree angle to the house to match the existing deck and creates a very dramatic effect. 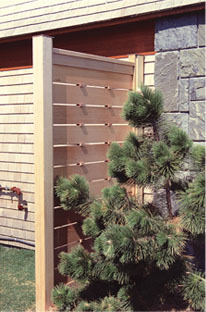 Additional fencing on this property hides a utility box and shields a shower stall in this extraordinary waterfront setting in Maine.